Iconic image of early Chicago. 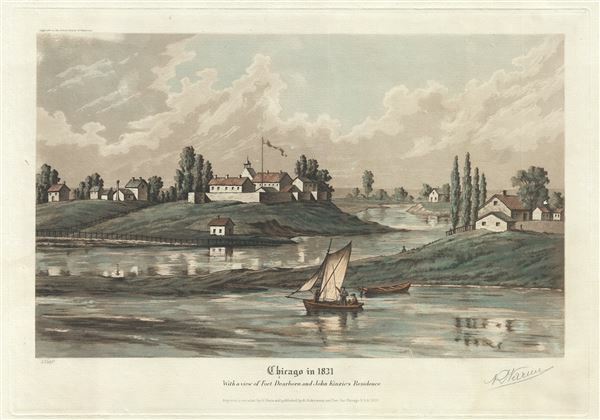 Chicago in 1831 With a view of Fort Dearborn and John Kinzie's Residence. An extremely attractive 1929 hand colored aquatint view of Chicago in 1831 by the French artist Raoul Varin. The view, part of a series completed by Varin between 1927 and 1932, illustrates Fort Dearborn and the surrounding homes. The buildings illustrated, from left, are the homes of John Dean and J. Baptiste Beaubien, Fort Dearboarn (Center), and the homes of D. Wolcott and John Kinzie. Varin seems to have based his view on an earlier watercolor composed in 1831 by Juliette M. Kinzie, whose home appears at the right edge of this graphic. An early version of the Kinzie watercolor was published in Juillette's 1856 book, Wau-Bun: The 'Early Day' in the Northwest, which is considered a key narrative of early Illinois history. While the Varin view offered here and the Kinzie view are strikingly similar in composition, Varin's work is far larger, graphically superior, and offers a few embellishments - such as the sailboat situated front and center. The Varin view of Chicago is extremely scarce with only 125 having been printed - all of which were signed by Raoul Varin in the lower right margin. All are also numbered in the lower left, this being 25 of 125 - an extremely early impression off the plate. The view was published by A. Ackermann and Son of Chicago. It is worth noting that most Varin prints suffer from poor framing and are today in terrible condition. The present example is near flawless. Raoul Varin (1865 - 1943) was a French watercolorist active in Europe and the North America in the late 19th and early 20th centuries. Varin exhibited in the Salon of French Artists and received an honorable mention in 1892. He is most famous for his historic Chicago aquatint views, of which he produced some 31 between 1926 and 1932. The collection included historic views drawn from early sources as current views of Chicago as Raoul saw it. Some were engraved by Ernest Byfield, who was the initial publisher of the series. Later, after Byfield went bankrupt, publication was taken over by A. Ackermann and Son's Chicago office. Buoyed by the success of his Chicago series, Varin went on to produce a series of 'Old New York', images, but these did not attain the same level of popularity. Very good. Wide margins. Original platemark. Blank on verso. Signed by author in pencil.